You will be arraigned by the judge. You can ask to be released on personal recognizance. You will find out your charges. Your case will either be tried or settled before trial. Do not do this without a lawyer- this is a tricky process with many consequences. You may not have meant to drive under the influence. However, it occurred and now you’ve been charged with a DUI offense. It happens. Many of our clients don’t realize that they’ve gone over the limit before getting behind the wheel. They make the wrong decisions and then get arrested for drunk driving. Sometimes, they are traumatized by the entire experience. For sure, getting arrested is stressful. Also, DUI charges tend to carry more than a little social stigma. So, you’re likely to be going through a lot emotionally after you’re pulled over and given a breath test. 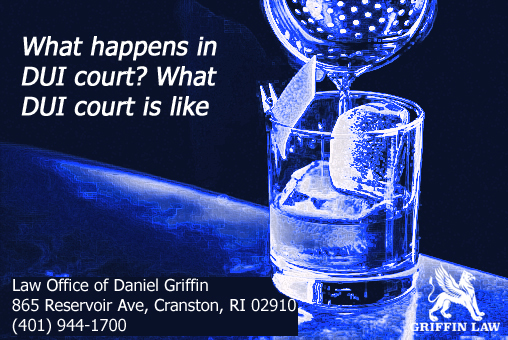 If you’ve been charged with a DUI, we strongly recommend contacting Attorney Daniel Griffin today. We are here to help. We can guide you through the court process and our drunk driving lawyer will be by your side while you are in court. We’ll help you by letting you know exactly what will happen in DUI court and how DUI court works. We want to give you peace of mind by sharing every important fact with you. Today, we’d like to share some facts about DUI court. This guide is detailed, but we definitely have a lot more information to share. When you hire DUI attorney Griffin, this legal eagle will give you every fact that you need, while also helping you to build the strongest defense possible. This type of charge is a big deal. It is serious. So, you are advised to hire a lawyer as soon as you’ve been charged with a DWI or DUI. The first step in the court process will be an Arraignment. During this part of the process, a judge will detail the charges filed against you. Then, you will need to offer a plea. In general, people do plead “not guilty”. However, your plea is something that your Rhode Island drunk driving attorney will discuss with you before you go to the arraignment. You’ll learn the pros and cons of both pleas and you’ll be able to make a wise and informed decision, based on the facts in your case. After you enter a plea, the question of a bail amount will be addressed. A judge may make the decision to decrease the amount that you will need to pay for bail. The judge may also make the decision to release you, due to your own recognizance, without requesting extra bail. Next, the opposing counsel, which is the district attorney, will give your lawyer a folder of evidence which pertains to your case. This may include reports from law enforcement, as well as the results of any blood alcohol tests which were administered. This phase of the court process is referred to as, “discovery”. After discover, the dates for the phase of court will be set. This next phase will be pretrial motions. The judge decides on the dates. Next, there will be a preliminary hearing. During this phase of court, the judge will make a decision about whether or not the district attorney has sufficient evidence to convince the jury that you drove drunk. At this stage, DUI lawyer Griffin will size up the legal situation and then give you expert advice about your choices. A plea bargain may be offered which is centered on negotiation between your lawyer and the DA. Sometimes, plea bargains are not offered. If a plea bargain is offered, your lawyer will be able to fight your corner and try to get your charge reduced to a charge of lesser gravity. Afterwards, your lawyer may bring forward pretrial motions, which are attempts to keep evidence which is harmful to your defense out of the trial. Afterwards, the main court case, by jury or judge, will proceed. Quite often, these cases are settled via plea bargains, so it’s possible that you won’t have to endure a full trial. Do You Need DUI Legal Help? As you can see, there is a lot to a DUI charge. There are a lot of steps and there’s quite a bit of red tape. It’s important to hire a lawyer who’s worked hundreds of DUI cases or even thousands. When you hire DUI attorney Daniel Griffin, you will be accessing the legal services of a talented and dedicated DUI lawyer with years of experience and specialization. Since Dan knows how to help every client, he’s a real asset in the courtroom. Every case is different. The best way to learn your rights and to know where you stand is to contact Dan today. We are standing by to set up a consultation with our lawyer. When you attend this consultation, you’ll be able to share your story and the lawyer will ask you pertinent questions about your case. You’ll get realistic odds for your case and plenty of advice which is based on a very high level of legal skill and knowledge. You made a mistake when you drove under the influence. However, you don’t need to make any more mistakes. By choosing lawyer Dan Griffin today, you’ll be able to do something good for yourself. You’ll give yourself the highest level of legal protection as you prepare for your court appearances. As well, if you want to get a plea with a lesser charge, our lawyer is the right person to hire. The pro has helped a lot of clients to get plea bargains and reduced charges. As well, he has helped many clients to get drunk driving convictions off of their criminal records. When you choose us, you’ll be making a practical choice. We don’t overcharge and every client is treated with respect. You’ll find that Attorney Griffin offers great communication as well as superb legal skills. Our lawyer is great in the courtroom and will be able to let you know exactly what happens in DUI court and how DUI court works.